Tommy Hilfiger will launch Loud, a new duo of fragrances "built around a music proposition and aimed at Gen-Y users"; Loud For Her and Loud For Him also tie into Hilfiger's Get Loud denim campaign. British rock group The Ting Tings created the theme song, We're Not The Same, and reportedly had input into the fragrance development. Perfumers Aurelien Guichard and Yann Vasnier created the patchouli and rose-focused fragrances; Loud For Her also includes lychee. I guess if you’re really a Tommy Hilfiger devotee, you’re probably hopping all about in glee. I’m not a Hilfiger fan –and I’m sure good ole Tommy is fine with that as I sit here in my LLBean demin cut offs, croc sandals and tee-shirt that is probably too tight to wear in public (hey, I’m painting today so what do you expect?) —back to perfume…LOUD huh? yeah, that sounds real appealing….NOT. oh, and *yawn*….. This seems an effort to catch some young people who aren’t TH devotees, I think. The bottles look like LP’s! That’s neat. Way cool bottles! That and the fact that A.Guichard is one of the noses makes me want to at least know more of the notes. I expect my curiosity may very well stop there, though, it being Hilfiger and all. An LP is a vinyl record. Eep! Sometimes I’m astonished by how OLD I am. Hey, vinyl is all the rage again, but it seems to be referred to as vinyl over LP, which makes sense, since LP stood for Long Playing and that is kind of a moot point. I know…I was just joking! I’m old, too. What’s up with the LOUD thing? MAC’s latest collection is Louder Please. Loud is in? I have no idea. Looks like the bottle of Hugo Woman. “Generation Y” is one of the terms that has come into use for the generation that followed Generation X (Gen X = those born approximately from t1961 to 1981). Generation Y is, therefore, those born from ~late 1970’s onward. Another name for “Generation Y” is “the Millennial Generation” (or “Millennials”), since they came of age around the turn of the millennium. They are also known as “Echo Boomers”, as they represent an increase in the birth rate in the 80’s and 90’s, and many of them are children of Baby Boomers. It’s the overlap that confused me. You can be born in the early 70’s and be able to fit in both Gen X and Gen Y. Maybe you get to choose. It comes from trying to delineate people into “generations”. The same thing happens with the Baby Boomers and Generation X. Everyone pretty much agrees that the Baby Boom started in 1946 (after WWII), but there is disagreement as to when it ended. If you were born in the early 1960’s, as I was, you are either a young Baby Boomer or an old Gen-X, depending on whom you talk to. My car, the Toyota Echo, was marketed at Echo Boomers. I have never figured out when you are no longer a Baby Boomer, but I am definitely not an Echo. 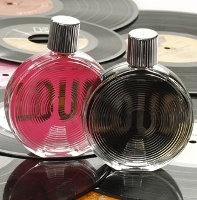 I don’t know…the name “Loud” for a fragrance seems wrong somehow ! Like a deragotory term. It is funny because if you google ‘tommy hilfiger loud’, you’ll come across quite a few references to the loud clothes. “users”? What a strange word to use. Is Gen-Y some sort of product? (I know Gen-Y refers to the Gen Y “generation”…but users of what?) I write documentation for products. There’s a whole debate about the term “user” – it’s so sterile. Using it in reference to a fragrance shows just how techno-geek we’re all becoming! In my line of work it means you’re an active drug addict. It’s an awkward word to use, even if it doesn’t have those connotations for you. The addict, or the internet user as Ojeda pointed out – I suspect this might be intentional. I’m guessing it alludes to users of internet applications? A characteristic of Gen Y kids (or “kids” — I’m Gen Y, but I’m in my 20’s) is that we grew up socializing on networks and phone apps, etc. I guess they’re trying hard to ~relate to us~ or whatever. But no kidding, it’s lame. Am I the only one who hates the bottles? I’m sure you’re not. I wonder if I would like them less if they weren’t pictured with the LPs? Oh, this is a series of cutting quips waiting to happen. Nice bottles, though. Surprised that they’re going after us Gen-Y “users”; I thought the Gen Z’s had already taken us over in terms of marketing potential (Bieber! Cyrus! Jonas!). I know I’m a little late to the game on this one but with a name like Loud I was expecting to see some oud in the list of notes. Seems lime a missed opportunity. Oud has way more of a rockin’ edge then lychee or patch in my opinion.